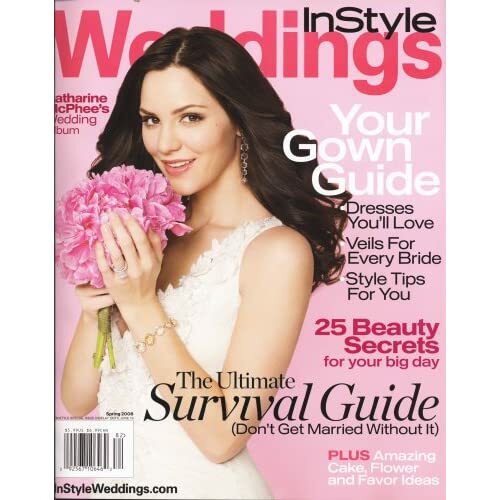 Peek inside the Spring 2008 issue of In Style Weddings with "Bridal Beauty Secrets". Reapplying many layers of lipstick will make lips dry (on top of all that kissing, drinking and eating). A non-greasy tinted lip balm in the same shade as your lipstick isn't as messy or prone to feathering as gloss or lipstick. 1. Back-combing creates a solid foundation for your headpiece. Spritz the comb of your headpiece with hairspray before attaching it. 2. Create shine, not an oil slick. Mist your brush with a shine-enhancement product, then go over tresses gently. 3. Tame baby flyaways with clear brow gel. Frederic Fekkai Glossing Sheer Shine Mist , $22.50; beauty.com . Spring and summer brides should switch to a lighter moisturizer to keep makeup from sliding. Fall and winter brides should depend on a tinted moisturizer to warm up and even out your complexion. MD Skincare All-in-One Moisturizer Tinted Sunscreen SPF 15 , $44/1.7 oz; beauty.com . Splurge on perfume, as opposed to cologne or eau de toilette, advises Susanne Lang, founder of Susanne Lang Parfumerie in Toronto. Perfume is stronger and longer-lasting than lighter products, which evaporate faster. Susanne Lang Midnight Orchid Eau de Parfum , $50; Beauty Bridge . Choose a shimmery (but not overly glittery) polish, like Orly Nail Lacquer in Sheer Beauty. The mica particles cling to the nail bed, so the polish tends to last longer and chip less.